The Stuttgart-based firm used Rétromobile to present prizes for its second "Classic Restoration Competition". The German manufacturer's commitment to preserving its heritage is nothing new. A few years after it was founded, when clubs were being created for the owners of its models, it ensured that most of the parts for the cars that it no longer manufactured were available. A restoration workshop was opened up at the factory, which focused on Porsches used for racing, and then Classic Porsches. Then more recently, Classic Porsche Centres started appearing more or less all over the world. France opened up its own one in 2012, in Vélizy, just outside Paris. In 2014, as a means of encouraging Porsche Centres outside of Paris to start maintaining and restoring (partially or totally) the manufacturer's Classic models (cars built before 1993), Porsche France created a "Classic Restoration competition”. The first edition of this competition involved only seven vehicles, and showcased the expertise, knowledge and skill of Porsche's official network. The four prize-winning vehicles were exhibited last year at Rétromobile's Porsche stand. 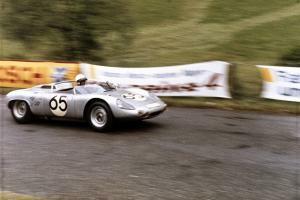 The competition gave rise to a great deal of enthusiasm, and so Porsche France decided to stage a second one. It ran from April to December last year and attracted even greater numbers of competitors. Nine Porsche Centres were involved throughout the country, representing nearly half of all French investors. The competition's format has now evolved: instead of four prizes – one for each category (Bodywork, Mechanical and Marketing) plus a general one, Porsche is now awarding two prizes at this year’s Rétromobile – Complete Restoration and Partial Restoration based on the three 2014 categories. On 17 and 18 December last year, the nine competitors gathered at the Le Mans Porsche Experience Centre that had opened just a few months previously. Over these two days, the jury (made up of 11 people from the specialist press, Porsche and its partner companies) examined the nine vehicles with a fine tooth comb. Although the competition is open to cars built before 1993, the manufacturer did make a couple of exceptions – a rare 1995 993 Carrera RS Clubsport and a 1994 preproduction Carrera. Most cars – a total of five – competed in the "complete restoration” category: 356 B 1 600 S (Lorient), 911 2,4 S (Arpajon), 993 RS Clubsport (Rouen), 2.0 S (Montpellier), 930 Turbo (Bordeaux). And in the "partial restoration" category, the jury had to choose between four vehicles: 911 SC Targa (La Rochelle), 911 Carrera 3,2 (Toulouse), 911 Speedster Turbolook 89 (Vélizy), 993 Carrera (Montélimar). Everyone was kept in suspense until Rétromobile, which was where the two winners were revealed and the prizes awarded. 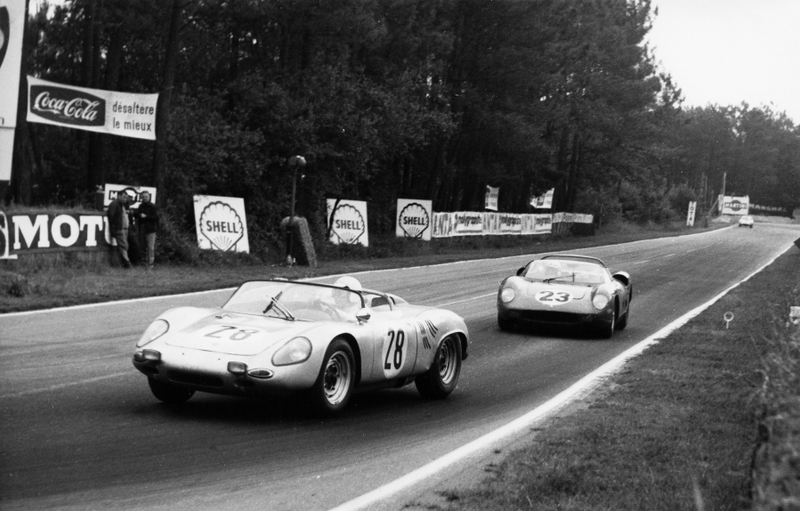 It's no coincidence that the Porsche museum sent this 1961 prototype to Paris. The manufacturer announced that it was soon going to be adding the number “718” to the next generation of Boxsters and Caymans. The six-cylinder engines would be replaced with new flat-four engines. 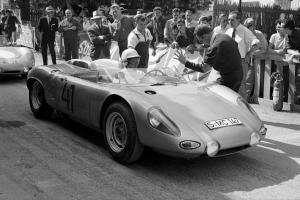 In 1961, the number 134 718 W-RS Spyder for Bonnier-Gurney lined up at the start line at the Targa Florio, fitted with a 1966 cc four-cylinder 165 hp engine. Its wheelbase had been increased to 233.5 cm, meaning it could accommodate an enlarged flat-eight engine during the development phase. 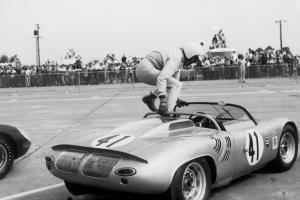 The contraption looked like a large 718 RS60 Spyder, fitted with imposing formwork overhanging the engine. Barely 93 mm above the ground, this experimental vehicle won second place in Sicily. The following year, the formwork was removed and the four-cylinder engine was replaced by a 2 L eight-cylinder engine. The car featured a double overhead camshaft and a dual ignition system, delivering 240 hp and weighing 685 kg. Another victory in Sicily persuaded the manufacturer to enter the Spyder in the European Mountain Championships. A decision that it would not regret. Edgar Barth won the title two years in a row (1963-1964).